One of Adolf Hitler’s principal lieutenants in the 1920s and ‘30s. Hess, the son of a German merchant, was born in Alexandria, Egypt. After serving in the German army during World War I, he joined the fledgling Nazi Party in 1921. Hess participated in the Nazi attempt to overthrow the Bavarian government in 1923 and was imprisoned with Hitler at Landsberg, becoming the Nazi leader’s private secretary. After Hitler became chancellor of Germany in 1933, he appointed Hess his deputy in charge of the party organization. In 1934 he was elevated to the rank of minister and appointed a member of Hitler’s cabinet. Hitler named him third deputy of the Reich in 1939, placing him directly below the Nazi leader Hermann Göring in line of succession. Two years later, when World War II was reaching its height, Hess made a solo airplane flight to Scotland; on his immediate arrest as a prisoner of war he announced that he had flown to Britain to persuade the British government to conclude peace with Germany. At the Nuremberg Trials in 1946, Hess was cleared of war crimes and crimes against humanity but was convicted of crimes against peace and jailed for life. He spent 40 years in Spandau Prison in Berlin and was the last remaining inmate at the prison when he was found hanged there in August 1987. Far right extremists made regular pilgrimages to his grave in Wunsiedel, Germany, prompting the town to remove his grave from the cemetery and scatter his remains at sea. Sources: “Rudolf Hess,” Microsoft® Encarta® Online Encyclopedia 2000 © 1997-2000 Microsoft Corporation. All rights reserved. 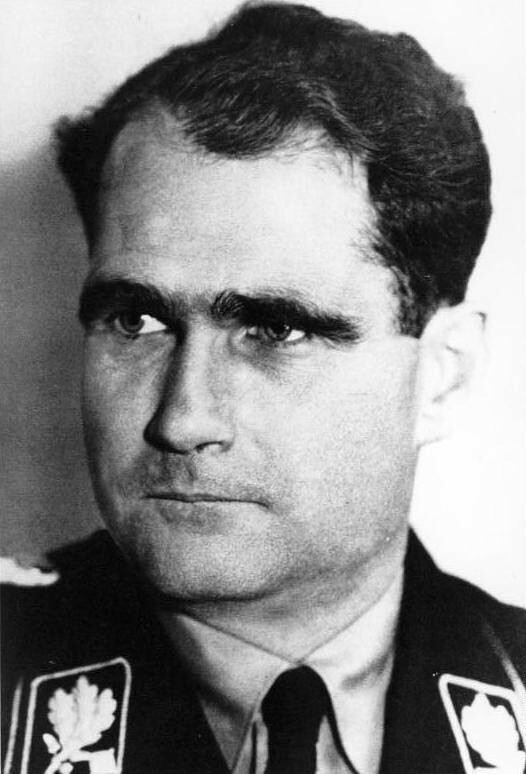 “Top Nazi Rudolf Hess exhumed from ‘pilgrimage’ grave,” BBC News, (July 21, 2011).